Hooooowwwwww is it already August?! This year, man. It’s flying by! As much as the Nordstrom Anniversary Sale has gotten me thrilled for cool fall weather and new pieces for the season, it’s hard to really get in that mindset when it’s 100 degrees every day. 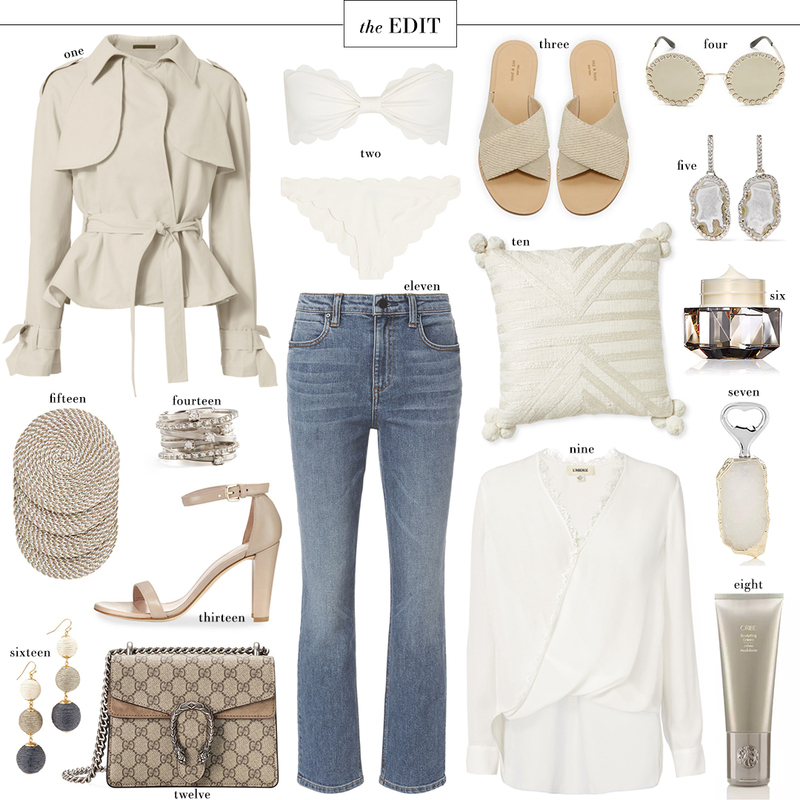 Light and airy fabrics, soft neutrals and versatile accessories are hopefully going to get me through this last month (or two, for us Texas gals) of summer! I’m really loving this stone color as a neutral at the moment – it looks great in trenches, handbags, shoes… even sunglasses! I found two beautiful trench styles in this khaki stone color, and both are on sale for under $200! Check out this draped + belted trench or this drawstring waist coat with matching sleeve details. This pair of putty velvet slides would be super cute with jeans on the weekends! This zipped leather tote would make a wonderful weekender bag for short trips! It comes with a detachable shoulder strap too. These Chloe closed-toe espadrilles are a chic staple you can wear with dresses or pants until the weather cools down. Not exactly a transitional item, but this fur-trim cashmere cape is divine! This would be such a versatile clutch year round! Love the sleek design and optional shoulder strap. If you’re looking for a super comfortable boot to wear this fall, try this ankle style or this over-the-knee pair! This cardigan from the Neiman Marcus cashmere collection looks incredible luxe and soft! Perfect for lounging, work or travel! I love the gold hardware against the gorgeous taupe color on this pebbled leather tote. Such a great everyday bag! Seriously, time is going by too fast! These neutral picks are gorgeous! Those are the BEST coasters – tons of colors to choose from, they don’t let the water pool on top, and will not stick to your tables! I have them in three different colors and will be purchasing more. I love each and every piece. I need all of these items, they are so cute and I adore the white color scheme!